Hope Androyna demonstrates the Heimlich maneuver on Alan Michl. Hope Androyna demonstrates how to give yourself the Heimlich maneuver when you are home alone. 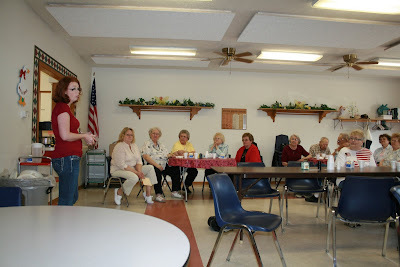 Hope Androyna giving a presentation on choking at the Exeter Senior Center. 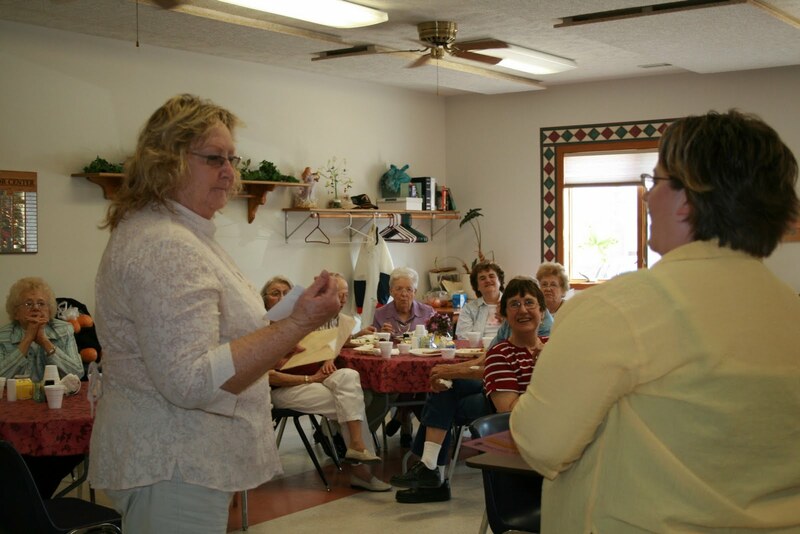 Choking 101 was the topic at the Exeter Senior Center after their lunch bunch on Tuesday. 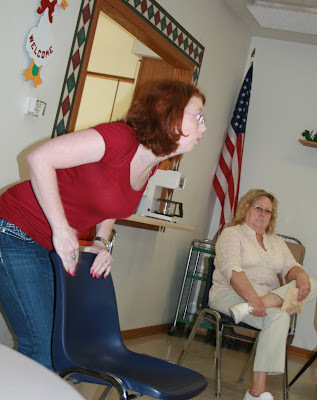 After the plates were cleared away, Exeter Rescue Squad member Hope Androyna took the floor and shared some of the basics about choking with the guests. She made several important points for those who live alone, showing them how to give themselves the Heimlich maneuver using a chair. She also gave hints on how to give the Heimlich maneuver properly and want to do if an infant or small child is choking. Androyna, who is certified to teach EMT's, also talked about CPR with the group of seniors and their guests. She emphasized that "it doesn't matter if you do it correctly (with the number of compressions to breaths changing all the time), anything you are doing helps. Whatever you do outside the hospital helps keep blood flowing." She reminded those in attendance that the should not do any breaths unless they have a CPR mask, "chest compressions will keep the oxygenated blood moving." After Androyna spoke, Exeter Village Chairman of the Board, Alan Michl gave a summary of some of the highlights of the last year and a half in the village. To start, he gave a report on the pool which opened last July 1st. He informed the group that the Village plans to put more sidewalks in the park and will install the slide on April 23rd. He also mentioned the ATV ordinance the village has established requiring drivers to be 16 with a valid driver's license, insurance and a flag on the ATV. He also reminded the group that ATV's are not allowed on main street from 7:00 a.m. -5:30 p.m. Monday through Saturday. There was group discussion on how Exeter, despite a few abandoned vehicles and rundown homes looks very nice for a town of its size. Michl reminded the group that the Spring Clean Up dumpster will be available April 24th and May 1st. Michl talked some about the part-time police agreement the Village has with the City of Friend Police Department. The Village had researched contracting with the Sheriff's Department for police protection but they would not enforce village ordinances and their contract price was considerably more than the budget would allow. Michl also mentioned two positive new additions to the village, the Village of Exeter website and the recycling trailer. He also mentioned the update of the neon sign courtesy of the Exeter Community Foundation. The new breathalyzer has arrived, but Michl noted that it was paid for through a grant to replace the old one the Village had. Michl also informed the group that Richard Erdkamp had been hired as the summer help and that the village will be looking at replacing the loader soon. Those in the crowd asked if the potholes in town will be taken care of soon and Michl assured them they would but some sections of streets would have to be replaced. He also mentioned that the Village will be looking into establishing a truck route to handle the traffic from the coop. Carol Williams (left) receives a gift certificate to Greg's Market from Brenda Motis for guessing the correct date as to when all the snow in Exeter would be melted. She chose Easter Sunday and got it right!